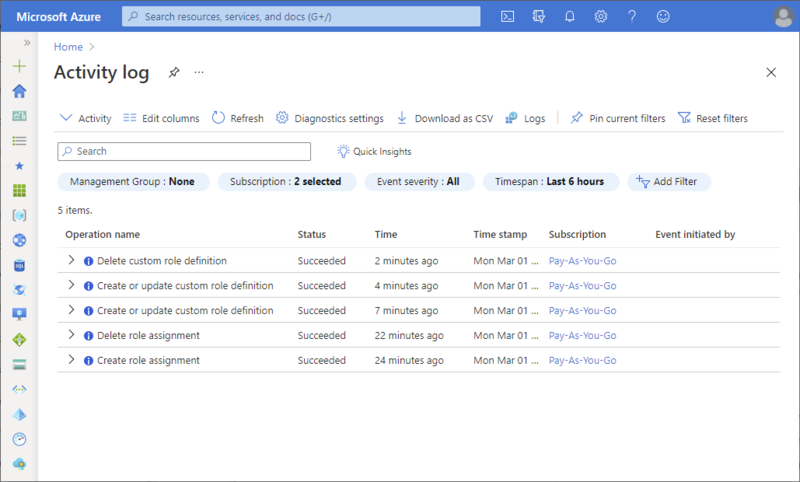 Sometimes you need information about role-based access control (RBAC) changes to Azure resources, such as for auditing or troubleshooting purposes. 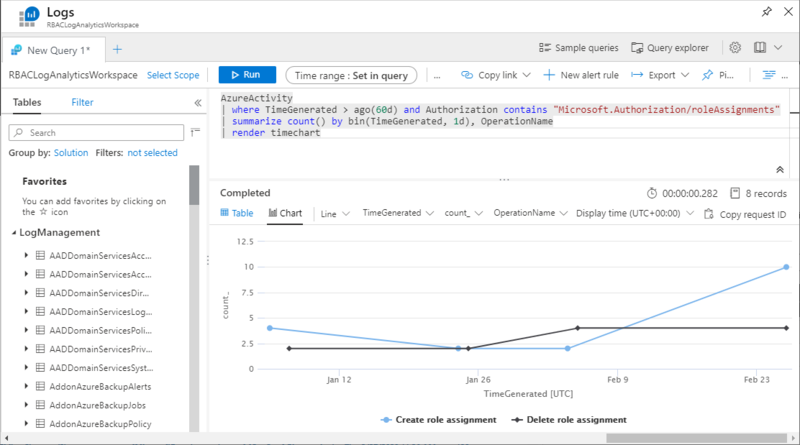 Any time someone makes changes to role assignments or role definitions within your subscriptions, the changes get logged in Azure Activity Log. You can view the activity logs to see all the RBAC changes for the past 90 days. The easiest way to get started is to view the activity logs with the Azure portal. The following screenshot shows an example of an activity log that has been filtered to display role assignment and role definition operations. It also includes a link to download the logs as a CSV file. For more information about activity logs, see View events in activity log. To view activity logs with Azure PowerShell, use the Get-AzLog command. To view activity logs with the Azure CLI, use the az monitor activity-log list command. Create a Log Analytics workspace. Configure the Activity Log Analytics solution for your workspace. View the activity logs. A quick way to navigate to the Activity Log Analytics solution Overview page is to click the Log Analytics option. Optionally use the Log Search page or the Advanced Analytics portal to query and view the logs. For more information about these two options, see Log Search page or the Advanced Analytics portal. | where TimeGenerated > ago(60d) and OperationName startswith "Microsoft.Authorization/roleAssignments/write" and ActivityStatus == "Succeeded"
| where TimeGenerated > ago(60d) and OperationName startswith "Microsoft.Authorization/roleAssignments"